A couple of weeks ago, I got an email from Dorothy, a blog reader, asking me to test out a recipe for Pan de Sal. 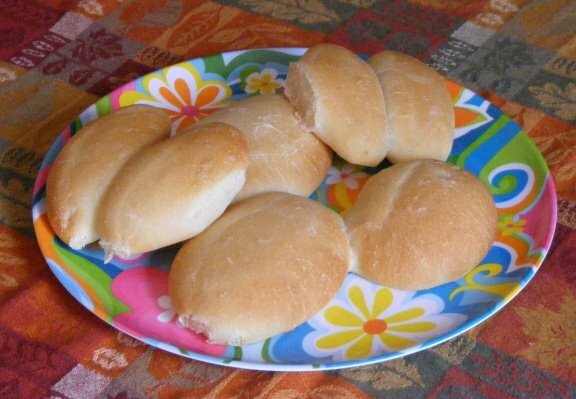 Pan de Sal is a traditional Filipino roll, usually eaten for breakfast and, despite its name, is on the sweet side. I did not roll the dough in breadcrumbs from previous pan de sal as is traditional. The recipe below doesn’t address this but if I were to try it, I’d probably roll the dough in the crumbs just before the second rise. The original recipe calls for the dough to be divided into 4 equal pieces, rolled into logs 1/2 inch in diameter and then cut into 1/2 inch pieces. I thought this was too small (those are the smaller rolls in the picture above) so instead, I rolled the logs out into 1-inch diameter, and cut into 1-inch pieces. Put the warm water in a small mixing bowl and add the yeast and 1 teaspoon of the sugar; stir to dissolve. Let stand until creamy, about 10 minutes. In a bowl of a stand mixer, combine the remaining sugar and the oil and mix until smooth using the paddle attachment. Add the salt, 1 cup of flour and the yeast mixture; stir well. Switch to the dough hook, and add the remaining 5 cups flour, 1/2 cup at a time, until the dough pulls away from the sides of the bowl. Using the dough hook, continuing kneading the dough until smooth, supple and elastic; about 10 minutes. If the dough is too sticky, add a tablespoon or two of flour. Lightly oil a large mixing bowl, place the dough in it and turn to coat the dough with oil. Cover with a damp towel or plastic wrap and let sit in a warm place until the dough has doubled in volume; about 1 hour. Turn the dough onto a lightly floured surface and divide into 4 equal pieces. Form each piece into a ball and roll out into a log about 1 inch in diameter. Using a sharp knife, cut each ‘log’ into 1 inch pieces. Place the pieces, flat side down, onto two lightly greased baking sheets. Gently press each roll down to flatten. Cover the rolls with a damp cloth and let rise until doubled in volume, about 30 minutes. Preheat oven to 375 degrees F. Bake rolls until golden brown, about 20 minutes.